A composition comprising a first polymer having pores, nanoparticles dispersed within the pores of the first polymer, the nanoparticles comprising a second polymer and at least one pharmaceutically active agent dispersed in the second polymer, and heparin covalently bonded to at least one of the first and second polymer. The present invention relates to stents coated with nanoporous articles comprising nanoparticles comprising at least one pharmaceutically active agent and at least one polymer. heparin covalently bonded to at least one of the first and second polymer. In one embodiment, the heparin is covalently bonded to one or both of the first and second polymers. In one embodiment, the polymer covalently bonded to heparin is biodegradable. In one embodiment, one or both of the first and second polymers is biodegradable. In one embodiment, the biodegradable polymer is chosen from polylactides. In one embodiment, the biodegradable polymer is chosen from poly(l-lactide), racemic polylactide, poly(l-lactide-co-glycolide), racemic poly(l-lactide-co-glycolide), poly(l-lactide-co-caprolactone poly(d,l-lactide-co-caprolactone), poly(l-lactide-co-trimethylene carbonate) and poly(d,l-lactide-co-trimethylene carbonate). In one embodiment, the first and second polymers are the same. In one embodiment, at least one of the first and second polymers comprises a blend of one or more polymers. heparin covalently bonded to at least one of the first and second polymers. In one embodiment, the concentration of the at least one pharmaceutically active agent based on the surface area of the stent ranges from about 1.0 to about 1.4 μg/mm2. In one embodiment, the device further comprises at least one additional coating comprising a polymer covalently bonded to heparin, the at least one additional coating comprising at least one pharmaceutically active agent. In one embodiment, wherein the polymer is biodegradable. In one embodiment, the device comprises at least two additional coatings. In one embodiment, the device comprises at least one additional coating and a protective coating. In one embodiment, at least one of the first and second polymers degrades by hydrolysis in a natural intraluminal human body environment at preselected rates of degradation. wherein the presence of each of R1 and R2 and R3 is optional and R1 and R2 and R3 are each independently selected from alkyl, aryl, alkoxy, halogen, hydroxy, and amino. In one embodiment, at least one of the first and second polymers degrade by hydrolysis in a natural intraluminal human body environment at preselected rates of degradation. In one embodiment, the nanoparticles further comprise a polymer that is the same or different from the porous polymer, the nanoparticles being porous or nonporous. In one embodiment, at least one of the nanoparticulate polymer and the porous polymer is biodegradable. In one embodiment, at least one of the nanoparticulate polymer and the porous polymer further comprises heparin. In one embodiment, the heparin is covalently bonded to the polymer. removing the solvent to form a porous polymer coating on the device. In one embodiment, the method further comprises impregnating the pores of the polymer with nanoparticles comprising at least one pharmaceutically active agent. In one embodiment, the nanoparticles further comprise a polymer which may be the same or different as the porous polymer. In one embodiment, at least one of the porous polymer or the nanoparticulate polymer is covalently bound to heparin. In one embodiment, at least one of the porous polymer or the nanoparticulate polymer is biodegradable. In one embodiment, at least one of the porous polymer or the nanoparticulate polymer comprises one or more of poly(l-lactide), racemic polylactide, poly(l-lactide-co-glycolide), racemic poly(l-lactide-co-glycolide), poly(l-lactide-co-caprolactone poly(d,l-lactide-co-caprolactone), poly(l-lactide-co-trimethylene carbonate) and poly(d,l-lactide-co-trimethylene carbonate). In one embodiment, both the nanoparticulate polymer and the porous polymer comprises a biodegradable polymer covalently bonded to heparin. In one embodiment, the heparin is covalently bonded to both the first and second polymers. wherein the at least one pharmaceutically active agent is chosen from heparin, flavonoids, paclitaxel and its analogs, rapamycin and its analogs and benzopyran-4-one compounds. In such an embodiment the active agent can be covalently bound to the second polymer. The first and second polymers can be the same or different. An active agent can also be covalently bound to the first polymer. The present invention relates to implantable medical devices having coatings comprising porous polymers and nanoparticles comprising pharmaceutically active agents for controlled release of the agents. Polymers having pores are well known in the art and methods for preparing porous polymers are encompassed by the invention, including foaming, mixing with gas, curing or setting in high humidity, etc. In one embodiment, the porous polymer, is prepared with the aid of a porogen. A porogen is an additive combined with either a polymeric material or precursors to a polymeric material. Removal of the porogen, accompanied by the step of curing or setting the polymer if necessary, results in pores in the region once occupied by the porogen. Exemplary porogens include salts (e.g., sodium bicarbonate), gelatins, sugars (e.g., glucose, sucrose, mannitol), polymeric particles (e.g., polyalkylene glycols, polysaccharides), solvents (e.g., water, alcohols, organic solvents), small organic molecules that are soluble in solvents (e.g., urea, citric acid, ascorbic acid, vitamin E, small chain hydrophilic molecules), frozen carbon dioxide, and combinations thereof. Porogens can be removed by allowing a solution to warm, e.g., in the case of frozen carbon dioxide, or by adding a solvent that dissolves the porogen but not the polymer. Porous polymers that encapsulate nanoparticles comprising pharmaceutically active agents may release the agents faster than normal porous polymers, if desired. The release rate can depend at least in part on the pore size, which in turn can depend on the size of the porogen. For example, larger pores can result in faster release rates compared to smaller pores. The size of the porogen can be selected to ultimately tailor the pore size in the porous polymer. In one embodiment, the pores in the porous polymer have at least one mean dimension that ranges from about 0.01 μm to about 500 μm, from about 0.01 μm to about 200 μm, from about 0.01 μm to about 100 μm, from about 0.01 μm to about 50 μm, from about 0.1 μm to about 500 μm, from about 0.1 μm to about 200 μm, from about 0.1 μm to about 100 μm, from about 0.1 μm to about 50 μm, from about 1 μm to about 500 μm, from about 1 μm to about 200 μm, of from about 1 μm to about 100 μm, or from about 0.1 μm to about 50 μm. Other pore size ranges can be readily envisioned and accessed by the choice of the porogen and reaction conditions. In another embodiment, pores have at least two mean dimensions that fall within the disclosed ranges. In one embodiment, the porogens are removed by particle leaching. In this method, a mixture containing the porogen and polymer (or polymer precursors) are subjected to a solvent, such as an organic solvent or water, that dissolves the porogen only. The porogen can be washed away with the solvent, leaving the polymer with pores. In another embodiment, the porogens are removed by thermally induced phase separation (TIPS). In this method, solvent is used as a pore-generating solvent and is combined with the polymer (or polymer precursor) to form a homogenous mixture. The temperature is altered in a sufficient amount (by either raising or lowering the temperature) to cause a phase separation between a polymer-rich phase and a polymer-poor phase. In one embodiment where a phase separation is caused by lowering the temperature, quenching the polymer solution below the freezing point of the solvent and subsequently freeze dried to remove the solvent. In another embodiment, phase separation can be obtained by raising the temperature and concurrently or subsequently removing the solvent by evaporation, optionally with the aid of a vacuum. Exemplary methods for performing TIPS can be found in Y. S. Nam and T. G. Park, “Porous biodegradable polymeric scaffolds prepared by thermally induced phase separation,” J. Biomed. Mater. Res. 47:8-17, 1999, the disclosure of which is incorporated herein by reference. In another embodiment, porous articles can be prepared by the use of solid particle additives, as described in U.S. Patent Publication No. 20060088567, the disclosure of which is incorporated herein by reference. Solid particle additives are lodged in regions of the polymer and create a network of interconnecting pores. The pore size can be controlled by the size of the solid particle additives. Either or both of the porous polymer or the nanoparticulate polymers can further comprise heparin that is covalently bonded to the polymer. Heparin is an anionic, multi-sulfate, mucopolysaccharide used as an anticoagulant. Heparin acts as an anticoagulant by binding to antithrombin III and inhibiting thrombogenesis primarily through inactivation of factors, IIa and Xa. In one embodiment, heparin can achieve at least one of the following functions, including inhibiting the activation of coagulation, potentiating the inhibition of the activated coagulation enzymes, and preventing platelet adhesion to the surface of the device. In one embodiment, the polymer is biodegradable. “Biodegradable polymer,” as used herein, refers to a polymer capable of decomposing, degenerating, degrading, depolymerizing, or any other mechanism that reduces the molecular weight of the polymer. In one embodiment, the resulting product(s) of biodegradation is soluble in the resulting body fluid or, if insoluble, can be suspended in a body fluid and transported away from the implantation site without clogging the flow of the body fluid. The body fluid can be any fluid in the body of a mammal including, but not limited to, blood, urine, saliva, lymph, plasma, gastric, biliary, or intestinal fluids, seminal fluids, and mucosal fluids or humors. In one embodiment, the biodegradable polymer is soluble, degradable as defined above, or is an aggregate of soluble and/or degradable material(s) with insoluble material(s) such that, with the resorption of the soluble and/or degradable materials, the residual insoluble materials are of sufficiently fine size such that they can be suspended in a body fluid and transported away from the implantation site without clogging the flow of the body fluid. Ultimately, the degraded compounds are eliminated from the body either by excretion in perspiration, urine or feces, or dissolved, degraded, corroded or otherwise metabolized into soluble components that are then excreted from the body. Suitable biodegradable polymers include poly(ethylene vinyl acetate), polyanhydrides, polyglycolic acid, collagen, polyorthoesters, polyesters, polyalkylcyanoacrylates, polyorthoesters, polyanhydrides, polyglycolides, polycaprolactones, polyurethanes, polyesteramides, polyorthoesters, polydioxanones, polyacetals, polyketals, polycarbonates, polyorthocarbonates, polyphosphazenes, polyhydroxybutyrates, polyhydroxyvalerates, polyalkylene oxalates, polyalkylene succinates, poly(malic acid), poly(amino acids), polyvinylpyrrolidone, polyvinyl alcohol (PVA), polyalkylene glycols (PAG) such as polyethylene glycol, polyalkylcarbonate, chitin, chitosan, starch, fibrin, polyhydroxyacids such as polylactic acid and polyglycolic acid, poly(lactide-co-glycolide) (PLGA), poly(l-lactide-co-trimethylene carbonate), poly(d,l-lactide-co-trimethylene carbonate), poly(d,l-lactide), poly(d,l-lactide-co-glycolide), polyglycolide, polyhydroxycellulose, poly(butic acid), poly(valeric acid), proteins and polysaccharides such as collagen, hyaluronic acid, albumin, gelatin, cellulose, dextrans, fibrinogen, and blends and copolymers thereof. In one embodiment, the biodegradable polymer is biocompatible, where a biocompatible polymer is a polymeric material that is compatible with living tissue or a living system, and is sufficiently non-toxic or non-injurious and causes minimal (if any) immunological reaction or rejection. In one embodiment, the biodegradable polymer is selected from poly-l-lactide (PLLA), poly(lactide-co-glycolide) (PLGA), poly(l-lactide-co-trimethylene carbonate), poly(d,l-lactide-co-trimethylene carbonate), polyvinyl alcohol (PVA), polyalkylene glycols (PAG) such as polyethylene glycol (PEG), albumin, fibrin, gelatin, starch, cellulose, dextrans, collagen, hyaluronic acid, polysaccharides, fibrinogen, poly (D,L lactide), poly(D,L-lactide-co-glycolide), poly(glycolide), poly(hydroxybutyrate), poly(alkylcarbonate), poly(orthoesters), polycaprolactone, poly(ethylene terephthalate), poly(butyric acid), poly(valeric acid), polyanhydrides and blends and copolymers thereof, poly(hydroxyvalerate), poly(hydroxybutyrate, poly(hydroxybutyrate-co-valerate), polydioxanone, polyorthoesters, polyanhydrides, poly(glycolic acid-co-trimethylene carbonate), polyphosphoesters, polyphosphoester urethanes, polyamino acids, cyanoacrylates, poly(trimethylene carbonates), poly(iminocarbonate), copoly(ether-ester) (e.g., PEO/PLA), polyalkylene oxalates, polyphosphazenes, polypeptides, and proteins. In one embodiment, the biodegradable polymer is chosen from PLLA, i.e., poly(l-lactide), the racemic version of PLA, i.e., poly(d,l-lactide), PLGA, i.e., poly(l-lactide-co-glycolide), the racemic version of PLGA, i.e., poly(d,l-lactide-co-glycolide), PLLC, i.e., poly(l-lactide-co-caprolactone and/or PDLLC, i.e., poly(d,l-lactide-co-caprolactone), poly(l-lactide-co-trimethylene carbonate) and poly(d,l-lactide-co-trimethylene carbonate). The polymer is first dissolved in a suitable solvent such as dichloromethane in the case of PLLA. One equivalent of an activating substance such as dicyclohexylcarbodiimide (DCC) is added to the PLLA solution. In this example, a solution of one equivalent of the pharmaceutically active agent, LY303511 which has an amine function dissolved in DMF is then immediately added to the dichloromethane/polymer solution. The reaction mixture is stirred at 40-50° C. for 4-18 hours until the reaction is complete as indicated by thin layer chromatography. The pharmaceutically active agent is thus covalently bound to the polymer. The same or similar covalent bonding process may be carried out with other pharmaceutically active agents having a nucleophilic group available for reaction with a complementary electrophilic group on the polymer coating material including those active agents identified/disclosed herein, such as heparin, rapamycin and its analogs, paclitaxel and its analogs, flavonoids and benzopyran-4-one compounds described or identified herein. Carbonyl activating agents other than DCC may also be employed such as N-(3-dimethylaminopropyl)-N′-ethyl-carbodiimide hydrochloride and carbonyldiimidazole. Exemplary pharmaceutically active agents include cell cycle inhibitors in general, apoptosis-inducing agents, antiproliferative/antimitotic agents including natural products such as vinca alkaloids (e.g., vinblastine, vincristine, and vinorelbine), paclitaxel, colchicine, epidipodophyllotoxins (e.g., etoposide, teniposide), antibiotics (e.g., dactinomycin, actinomycin D, daunorubicin, doxorubicin, idarubicin, penicillins, cephalosporins, and quinolones), anthracyclines, mitoxantrone, bleomycins, plicamycin (mithramycin), mitomycin, enzymes (e.g., L-asparaginase, which systemically metabolizes L-asparagine and deprives cells that do not have the capacity to synthesize their own asparagine); antiplatelet agents such as G(GP) IIb/IIIa inhibitors, GP-IIa inhibitors and vitronectin receptor antagonists; antiproliferative/antimitotic alkylating agents such as nitrogen mustards (mechlorethamine, cyclophosphamide and analogs, melphalan, chlorambucil), ethylenimines and methylmelamines (hexamethylmelamine and thiotepa), alkyl sulfonates-busulfan, nitrosoureas (carmustine (BCNU) and analogs, streptozocin), triazenes-dacarbazine (DTIC); antiproliferative/antimitotic antimetabolites such as folic acid analogs (methotrexate), pyrimidine analogs (fluorouracil, floxuridine, and cytarabine), purine analogs and related inhibitors (mercaptopurine, thioguanine, pentostatin and 2-chlorodeoxyadenosine (cladribine)); platinum coordination complexes (cisplatin, carboplatin), procarbazine, hydroxyurea, mitotane, aminoglutethimide; hormones (e.g., estrogen); anticoagulants (heparin, synthetic heparin salts and other inhibitors of thrombin); fibrinolytic agents (such as tissue plasminogen activator, streptokinase and urokinase), aspirin, dipyridamole, ticlopidine, clopidogrel, abciximab; antimigratory; antisecretory (breveldin); anti-inflammatory: such as adrenocortical steroids (cortisol, cortisone, fluorocortisone, prednisone, prednisolone, 6α-methylprednisolone, triamcinolone, betamethasone, and dexamethasone), non-steroidal agents (salicylic acid derivatives e.g., aspirin; para-aminophenol derivatives e.g., acetominophen; indole and indene acetic acids (indomethacin, sulindac, and etodalac), heteroaryl acetic acids (tolmetin, diclofenac, and ketorolac), arylpropionic acids (ibuprofen and derivatives), anthranilic acids (mefenamic acid, and meclofenamic acid), enolic acids (piroxicam, tenoxicam, phenylbutazone, and oxyphenthatrazone), nabumetone, gold compounds (auranofin, aurothioglucose, gold sodium thiomalate); immunosuppressives: (cyclosporine, tacrolimus (FK-506), sirolimus (rapamycin), azathioprine, mycophenolate mofetil); antigenic agents: vascular endothelial growth factor (VEGF), fibroblast growth factor (FGF); angiotensin receptor blockers; nitric oxide donors; anti-sense oligionucleotides and combinations thereof; cell cycle inhibitors, mTOR inhibitors, and growth factor receptor signal transduction kinase inhibitors; retinoid; cyclin/CDK inhibitors; HMG co-enzyme reductase inhibitors (statins); and protease inhibitors (matrix protease inhibitors). In one embodiment, the pharmaceutically active agent is an agent for preventing or reducing restenosis, e.g., for preventing or reducing restenosis subsequent to or associated with angioplasty. In one embodiment, the therapeutic agent exhibits synergy with a flavonoid as defined herein in preventing or reducing restenosis as well as in preventing or reducing secondary complications after angioplasty, including, e.g., acute, subacute and chronic secondary complications associated with angioplasty such as thrombus, inflammation, and responses of the immune system. Suitable second or further pharmaceutically active agents that exhibit synergy with the flavonoid as defined above include agents that are useful for treating restenosis and include known anti-inflammatory, anti-thrombogenic, anti-antigenic, matrix protease inhibitory, anti-migratory, anti-proliferative (e.g., a tubulin-binding anti-proliferative agent), cytostatic, and/or cytotoxic agents. Exemplary agents are those that are currently being used or considered as stent coating materials to combat restenosis, which include paclitaxel, derivatives of paclitaxel, sirolimus, and derivatives of sirolimus. Flavonoids are biosynthetically derived from acetate and shikimate such that the A ring has a characteristic hydroxylation pattern at the 5 and 7 position. The B ring is usually 4′, 3′4′, or 3′4′5′-hydroxylated. Flavonoids have generally been classified into 12 different subclasses by the state of oxidation and the substitution pattern at the C2-C3 unit. There are a number of chemical variations of the flavonoids, such as, the state of oxidation of the bond between the C2-C3 position and the degree of hydroxylation, methoxylation or glycosylation (or other substituents) in the A, B and C rings and the presence or absence of a carbonyl at position 4. Flavonoids for use in the present invention include, but are not limited to, members of the following subclasses: chalcone, dihydrochalcone, flavanone, flavonol, dihydroflavonol, flavone (found in citrus fruits), flavanol, isoflavone, neoflavone, aurone, anthocyanidin (found in cherries, strawberries, grapes and colored fruits), proanthocyanidin (flavan-3,4-diol) and isoflavane. Thus far, more than 10,000 flavonoids have been identified from natural sources. Berhow (1998) pp. 67-84 in Flavonoids in the Living System, ed. Manthey et al., Plenum Press, NY. In one embodiment, unless otherwise specified, “substituted” or “substituent” refers to substitutions with at least one of the following groups: alkyl, cycloalkyl, alkoxy, amino, amido, aryl, carboxy, cyano, cycloalkyl, halogen, hydroxy, nitro. In one embodiment, “alkyl” refers to a C1-C20 alkyl, such as a C1-C12 alkyl, or a C1-C6 alkyl. In one embodiment, “heteroalkyl” refers to alkyl groups substituted with at least one of O, N, S, or halogen. In one embodiment, “aryl” comprises mono-, bi-, or multi-carbon-based, aromatic rings, e.g., phenyl and naphthyl. In one embodiment, “heteroaryl” refers to an aryl as defined herein, wherein a ring carbon is replaced with at least one of 0 N, or S.
Flavonoids have a number of activities that are useful in the context of the present invention. These activities include e.g. anti-platelet aggregation, anti-thrombotic, anti-inflammatory, anti-atherogenic, anti-oxidant, inhibition of angiogenesis, inhibition of lipid oxidation and peroxidation, lipid-lowering and inhibition of cell cycle. In one embodiment, a composition of the present invention at least comprises a flavonoid with anti-platelet aggregation activity and/or anti-thrombotic activities. These activities may be assayed by methods know to the skilled person per se (see e.g. E. M. Van Cott, M.D., and M. Laposata, M.D., Ph.D., PCoagulation” In: Jacobs D S et al, ed. “The Laboratory Test Handbook,” 5th Edition. Lexi-Comp, Cleveland, 2001; 327-358). A composition of the invention may however comprises more than one flavonoid. For example, at least one flavonoid comprises anti-platelet aggregation activity and/or anti-thrombotic activities and the other flavonoid(s) comprise other useful activities as indicated above. 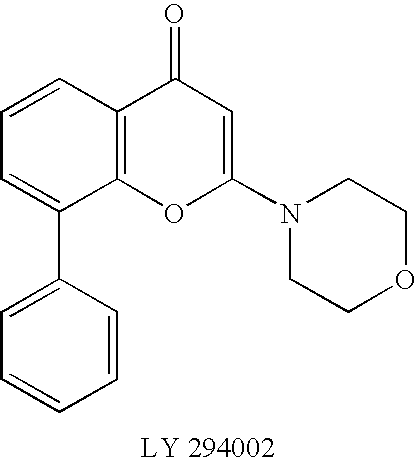 An exemplary flavonoid for use in the compositions of the present invention is a flavonoid that mediates the above anti-platelet aggregation, anti-thrombotic and anti-inflammatory activities through their ability to inhibit DNA topoisomerase II, protein tyrosine kinases, and/or nitric oxide synthase and/or modulation of the activity of NF-kappaB. These activities may be assayed by methods known to the skilled person per se (see, e.g., Andrea et al., 1991, Mol. Pharmacol. 40:495-501; the HitHunter EFC-TK assay from DiscoverX, Fremont, Calif.; Webb and Ebeler, 2004, Biochem. J. 384: 527-41; Akiyama et al., 1987, J. Biol. Chem., Vol. 262, 5592-95). Another exemplary flavonoid for use in the compositions of the present invention is quercetin or an analog of quercetin. Quercetin is typically found in plants as glycone or carbohydrate conjugates. Quercetin itself is an aglycone or aglucon. 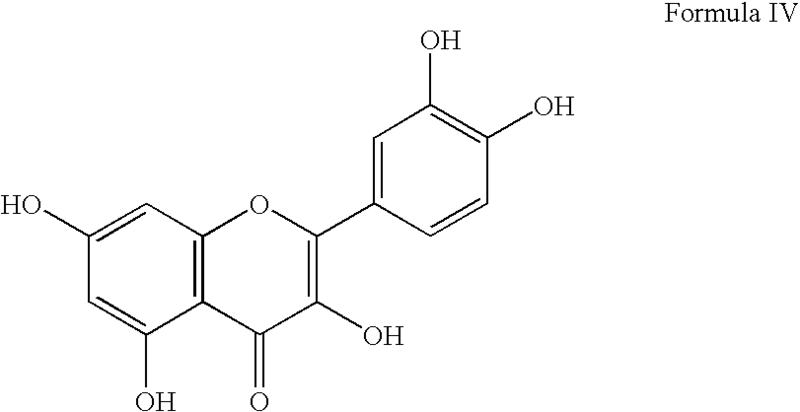 That is, quercetin does not possess a carbohydrate moiety in its structure. 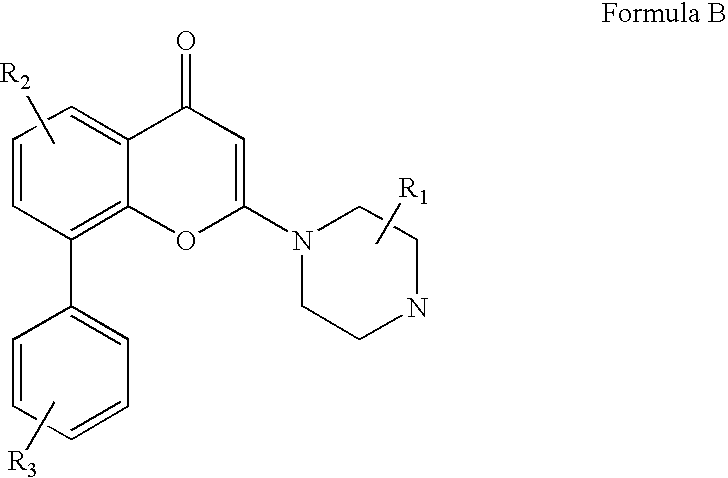 Analogs of quercetin include its glycone conjugates include rutin and thujin. Rutin is also known as quercetin-3-rutinoside. Thujin is also known as quercitrin, quercetin-3-L-rhamnoside, and 3-rhamnosylquercetin. Onions contain conjugates of quercetin and the carbohydrate isorhamnetin, including quercetin-3,4′-di-O-beta glucoside, isorhamnetin-4′-O-beta-glucoside and quercetin-4′-O-beta-glucoside. Quercetin itself is practically insoluble in water. The quercetin carbohydrate conjugates have much greater water solubility then quercetin. wherein the presence of each of R1 and R2 is optional and R1 and R2 are each independently selected from alkyl, substituted alkyl, heteroalkyl, cycloalkyl, substituted cycloalkyl, heterocycloalkyl, substituted heterocycloalkyl, aryl, substituted aryl, heteroaryl, substituted heteroaryl, alkoxy, halogen, hydroxy, and amino. wherein the presence of each of R1 and R2 and R3 is optional and R1 and R2 and R3 are each independently selected from alkyl, aryl, alkoxy, halogen, hydroxy or amino. If R1 or R2 or R3 are present, there may be one or more R1 or R2 or R3 substituents on each respective structure. Another example of a benzopyran-4-one compound is designated LY294002. 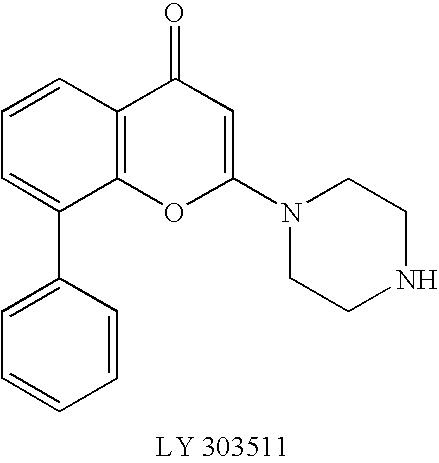 The dihydrochloride salt of 2-(4-piperazinyl)-8-phenyl-4H-1-benzopyran-4-one is commercially available from Sigma-Aldrich Corporation under the designation “LY303511.” The 2-(4-piperazinyl)-8-phenyl-4H-1-benzopyran-4-one compounds described herein may be synthesized based on the procedures described in Vlahos et al., J. Biol. Chem. 269: 5241-5248, 1994. Other salt forms of 2-(4-piperazinyl)-8-phenyl-4H-1-benzopyran-4-one are readily synthesizable following known techniques such as those described in Handbook of Pharmaceutical Salts, Properties, Selection and Use, Wiley VCH (2002). In one embodiment, the combination of heparinized polymer and pharmaceutically active agent comprise a combination of pharmaceutically active agents. If more than one pharmaceutically active agent is used, they can be present in combination in the same layer, or in separate heparinized polymer layers. Exemplary combinations include genistein plus sirolimus separately or in combination in one or more coatings and genistein and LY303511 or in combination in one or more coatings. In one embodiment, the dosage or concentration of, e.g., paclitaxel based on surface area on a typical coronary stent can range from about 0.1 to about 5 μg/mm2, or more than about 0.7 μg/mm2 (at lower dosage restenosis rates are higher), or less than about 3.0 μg/mm2 (higher will be cytotoxic), or ranging from 1.0 and 1.8 μg/mm2, and or about 1.4 μg/mm2. Typically, the amount of paclitaxel will increase linearly with the length of the stent. In one embodiment, for a typical series of coronary stent varying in length from 8.00 to 39.00 mm, the total paclitaxel content will vary from 50 μg to 250 μg. Suitable dosaging for drug-eluting stents is further described in U.S. Pat. No. 6,908,622, the disclosure of which is incorporated herein by reference. The dosage or concentration of e.g. sirolimus based on surface area on a typical coronary stent may be is 0.1 and 5 μg/mm2. In another embodiment, the dosage is more than about 0.7 μg/mm2 (at lower dosage restenosis rates are higher) and less than about 3.0 μg/mm2 (higher will be cytotoxic), such as ranging from 1.0 and 1.8 μg/mm2, e.g., about 1.4 μg/mm2. Typically, the amount of sirolimus will increase linearly with the length of the stent. For example, for a typical series of coronary stent varying in length from 8.00 to 39.00 mm, the total sirolimus content will vary from 50 μg to 250 μg. The dosage or concentration of a flavonoid or derivative thereof based on surface area on a stent (e.g. a typical coronal stent) may be is 0.1 and 40 μg/mm2. In one embodiment, the dosage of a flavonoid or derivative thereof based on surface area of a device of the invention is more than about 0.2, 0.5, 1.0, 2.0, 5.0 or 10 μg/mm2. In another embodiment, the dosage of a flavonoid or derivative thereof based on surface area of a device of the invention is less than about 30.0, 20.0, 15.0, 10.0, 5.0, 3.0 or 2.0 μg/mm2. Generally, the amount of the flavonoid or derivative thereof will increase linearly with the length of the stent. For example, for a typical series of coronary stent varying in length from 8.00 to 39.00 mm, the total flavonoid (or derivative thereof) content will vary from 28 μg to 3500 μg. Exemplary devices include sutures, staples, anastomosis devices, vertebral disks, bone pins, suture anchors, hemostatic barriers, clamps, screws, plates, clips, vascular implants, urological implants, tissue adhesives and sealants, tissue scaffolds, bone substitutes, intraluminal devices, and vascular supports. For example, the device can be a cardiovascular device, such as venous catheters, venous ports, tunneled venous catheters, chronic infusion lines or ports, including hepatic artery infusion catheters, pacemakers and pace maker leads, and implantable defibrillators. Alternatively, the device can be a neurologic/neurosurgical device such as ventricular peritoneal shunts, ventricular atrial shunts, nerve stimulator devices, dural patches and implants to prevent epidural fibrosis post-laminectomy, and devices for continuous subarachnoid infusions. The device can be a gastrointestinal device, such as chronic indwelling catheters, feeding tubes, portosystemic shunts, shunts for ascites, peritoneal implants for drug delivery, peritoneal dialysis catheters, and suspensions or solid implants to prevent surgical adhesions. In another example, the device can be a genitourinary device, such as uterine implants, including intrauterine devices (IUDs) and devices to prevent endometrial hyperplasia, fallopian tubal implants, including reversible sterilization devices, fallopian tubal stents, artificial sphincters and periurethral implants for incontinence, ureteric stents, chronic indwelling catheters, bladder augmentations, or wraps or splints for vasovasostomy, central venous catheters. Three pathophysiological phases can be distinguished subsequent to revascularization. Stage I, the thrombotic phase (days 0-3 after revascularization). This stage consists of rapid thrombus formation. The initial response to arterial injury is explosive activation, adhesion, aggregation, and platelet deposition. The platelet thrombus may frequently be large and can grow large enough to occlude the vessel, as occurs in myocardial infarction. Within 24 hours, fibrin-rich thrombus accumulates around the platelet site. Two morphologic features are prominent: 1) platelet/fibrin, and 2) fibrin/red cell thrombus. The platelets are densely clumped at the injury site, with the fibrin/red cell thrombus attached to the platelet mass. Undesired cell growth can also be a component of restenosis, the recurrence of stenosis or artery stricture after corrective surgery. Restenosis occurs after coronary artery bypass (CAB), endarterectomy, heart transplantation, or after angioplasty, atherectomy, laser ablation or stenting. Restenosis is the result of injury to the blood vessel wall during the lumen opening procedure. In some patients, the injury initiates a repair response that is characterized by smooth muscle cell proliferation referred to as “hyperplasia” in the region traumatized by the angioplasty. This proliferation of smooth muscle cells re-narrows the lumen that was opened by the angioplasty within a few weeks to a few months, thereby necessitating a repeat angioplasty or other procedure to alleviate the restenosis. The therapeutic compounds disclosed herein can be used to treat restenosis by administering the compound to the patient prior to, during and/or after coronary- or peripheral-artery angioplasty or atherectomy, coronary bypass graft or stent surgery, or peripheral vascular surgery (e.g., carotid or other peripheral vesselendarterectomy, vascular bypass, stent or prosthetic graft procedure). The benzopyran-4-ones may be delivered via luminal devices such as vascular stents or grafts. For example, a coated stent or graft as disclosed herein may be implanted at the vascular site of interest for controlled release of the pharmaceutically active agents over a desired time period. In another embodiment, the method is directed to treating autoimmune diseases. An “autoimmune disease” is a disease in which the immune system produces an immune response (e.g., a B cell or a T cell response) against an antigen that is part of the normal host (i.e., an autoantigen), with consequent injury to tissues. An autoantigen may be derived from a host cell, or may be derived from a commensal organism such as the micro-organisms (known as commensal organisms) that normally colonize mucosal surfaces. In an immune response, T and or B cells proliferate in response to a stimulus viewed as “exogenous” by the immune system. Although generally, immune responses are beneficial, there are situations where a decreased immune response is desired. For example, in autoimmune disorders, the cells of the immune system incorrectly identify a self component as exogenous and proliferate in response to the self component. Exemplary autoimmune diseases affecting mammals include rheumatoid arthritis, juvenile oligoarthritis, collagen-induced arthritis, adjuvant-induced arthritis, Sjogren's syndrome, multiple sclerosis, experimental autoimmuneencephalomyelitis, inflammatory bowel disease (e.g., Crohn's disease, ulcerative colitis), autoimmune gastric atrophy, pemphigusvulgaris, psoriasis, vitiligo, type 1 diabetes, non-obese diabetes, myasthenia gravis, Grave's disease, Hashimoto's thyroiditis, sclerosing cholangitis, sclerosing sialadenitis, systemic lupus erythematosis, autoimmune thrombocytopenia purpura, Goodpasture's syndrome, Addison's disease, systemic sclerosis, polymyositis, dermatomyositis, autoimmune hemolytic anemia, pernicious anemia, and the like. Another embodiment of the invention includes a use as defined above wherein the medicament comprises a further therapeutic agent as defined above. In one embodiment, the further therapeutic agent is selected from antiproliferative, antimitotic, antimicrobial, anticoagulant, fibrinolytic, anti-inflammatory, immunosuppressive, and anti-antigenic agents. In another embodiment, the pharmaceutically active agent is agent is paclitaxel, a derivative of paclitaxel, sirolimus (rapamycin), and a derivative of sirolimus. In one embodiment, the heparinized biodegradable polymer is effectively miscible enough with the select drugs (e.g. paclitaxel, sirolimus (rapamycin), flavonoids such as genistein) that the drugs can be dispersed throughout the matrix of the heparinized polymer in a concentration sufficient to impart the ability of the polymer matrix to elute the drug over a long enough period of time from the date of first implant, e.g. 30-120 days, to prevent restenosis, thrombosis and/or to reduce platelet adhesion and SMC (smooth muscle cell) proliferation simultaneously. In one embodiment, the pharmaceutically active agent is nonpolar relative to a heparinized biodegradable polymer. The miscibility of a nonpolar compound with a heparinized biodegradable polymer result may be surprising because the heparin moiety is polar and inherently immiscible with relatively non-polar moieties such as sirolimus, paclitaxel, (and related analogs and derivatives such as tacrolimus, zotarolimus, everolimus, and flavonoids such as genistein. 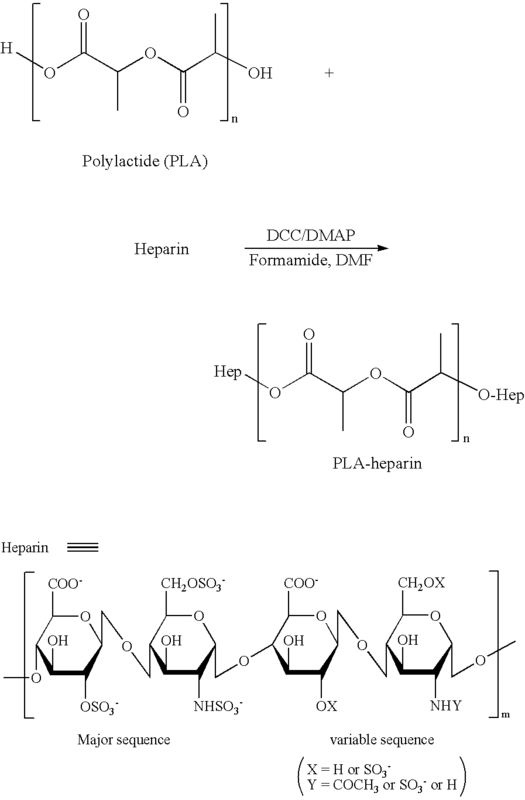 It is believed that the covalent bonding of heparin to the biodegradable polymer creates a new biodegradable polymer substrate that is fundamentally different in structure and reactivity from the original biodegradable polymer such that in vivo release of heparin over the full term of in vivo degradation of the biodegradable polymer is accomplished simultaneously with normal non-covalently bound elution of the selected drug that is dispersed throughout the matrix of the polymer substrate. Another animal model assay for restenosis can involve assessing the treatment of neointima formation following vascular injury, as disclosed in Jaschke et al., FASEB J. 2004 August; 18(11):1285-7, which describes local cyclin-dependent kinase inhibition by inhibiting coronary artery smooth muscle cell proliferation and migration. Rat carotid arteries can be injured by withdrawal of an inflated balloon. Stents as disclosed herein and uncoated stents can be inserted into the injured arteries. After euthanizing the rats after 14 days, the carotids can be fixed, sectioned and stained for evaluation. The stents disclosed herein should show reduced neointima formation compared to uncoated stents. 2) Reaction of Heparin with Imidoyl Ions of PVP in Heterogeneous Medium. Heparin in 75 ml of 20% Na2CO3 solution was added by stirring to imidoyl ions of PVP in chloroform-pyridine solution in which PVP was activated by a slight excess of thionyl chloride (5.0 ml or 8.3 g, 0.119 mole). The heparin addition lasted 30 minutes, during which heat and CO2 evolved. The reaction mixture was stirred and allowed to cool down to room temperature. Then the organic (chloroform-pyridine) layer of the solution mixture was separated from the aqueous layer. Evaporation of the organic layer under reduced pressure gave a residue with a trace of bitter odor (pyridine). The residue re-dissolved in a minimum of water. To the aqueous solution of the residue from the organic layer as well as to the aqueous layer from the reaction mixture, 50 ml of 5% cetyl pyridinium chloride (CPC) solution was added. White precipitates formed immediately. The precipitates were then filtered. A small additional amount of 5% CPC solution was added to each of the filtrates to check the completion of CPC precipitation. Repetitive precipitations were needed for the filtrate obtained from the aqueous layer. PVP-heparin was recovered by dissolving the white CPC complex in 3.2 N MgCl2, adding 50 ml of 2.5 N potassium thiocyanate to each of the solutions to precipitate CPC. Filtering the suspensions, the filtrate was dialyzed extensively against water as follows: 4 hours, 2×10 l; 24 hours, 2×10 l. Lyophilization of the dialysates gave white powders of 0.79 g from organic layer (H-I) and 6.35 g (H-II) from the aqueous layer, both gave positive Toluidine blue tests and positive tests with chloroform-iodine solution. The competition of reaction was confirmed by conducting Fourier Transform Infrared (FT-IR) and NMR spectroscopy. 1. The molecular weight of PLLA is measured by gel permeation chromatography (GPC). 2. The structure of PLLA-heparin is characterized by a Fourier Transform Infrared Spectrophotometer (FT-IR). 3. The content of conjugated heparin can be analyzed by HPLC and toluidine blue colorimetric analysis using UV spectrophotometry operating at 631 nm. The Example illustrates the preparation of stents containing multiple layers. One of ordinary skill in the art can readily manufacture a stent containing one or more layers based on the teachings of this Example. Multilayered stents can be manufactured from solutions of different polymers optionally containing therapeutic agents. The top coating can be a protective layer, such as a solution of heparinized polyvinylpyrrolidone in dichloromethane. The final stent can contain four layers by respectively spraying four separate solutions. The heparinized polymer and pharmaceutically active agents were provided as solutions or suspensions. The concentration of drugs were mixed together with the heparinized polymer depending on the selection of drug or drugs to be loaded on a stent or other delivery device. The stent can be hung between two collate with the help of hooks. The first solution or suspension can be sprayed on the stent at an optimum flow rate under the necessary amount of nitrogen pressure. During coating, the flow rate is maintained. The coating layer is dried for 10 minutes prior to spraying the next layer. Subsequent layer coatings can be performed in the same manner. The final layer was added by spraying the solution of heparinized polyvinylpyrrolidone in dichloromethane. After removing the stent from collate and completion of the layer coating, the weight of the stent is measured and recorded. The surface of the stent is checked under a microscope. The drug coated stents are kept in an air tight centrifuge tube and transferred to the clean room for further processing. Solid ascorbic acid is micronized to a range of particle sizes of <1 micron. Poly-l-lactic acid is dissolved in dichloromethane. Ascorbic acid (porogen) and the poly-l-lactic acid solution are mixed and placed on a rolling glass ball mill until the solid is evenly dispersed. The suspension is sprayed onto stents by the method described in Example 7 and the coating is dried under vacuum. The coated stents are soaked in methanol until all the ascorbic acid is dissolved leaving pores of the desired size. The stents are again dried under vacuum. Heparinized poly-L-lactic acid prepared from Example 2 are formed into nanoparticles containing a dispersed therapeutic agent (paclitaxel, rapamycin, genistein, flavonoid, LY294002 or LY303511) as prepared by methods known in the art (for example, see Example 8 of U.S. Pat. No. 5,716,981, in which the disclosure of Example 8 is incorporated herein by reference). The nanoparticles are isolated by centrifugation, suspended in water and sprayed onto the stent. The stent is dried and spray-coated with polyvinylpyrrolidone dissolved in dichloromethane as a protective layer in a manner similar to that described in Example 7. Solid glucose is micronized to a range of particle sizes of <1 micron, suspended in a mixture of heparinized poly-L-lactide and polyvinylpyrrolidone dissolved in dichloromethane, mixed and sprayed onto stents as described in Example 7. The stents are soaked in water until the glucose dissolves leaving pores of the desired size. Nanoparticles (as described in Example 7) of a mixture of heparinized poly-l-lactide (as described in Example 2), polyvinylpyrrolidone and genistein are deposited in the pores and the dried stents are top-coated with heparinized polyvinylpyrrolidone as in Example 7. Solid sucrose is micronized to a range of particle sizes of <1 micron, suspended in a mixture of heparinized poly-L-lactide (Example 2), heparinized 50/50 poly-d,l-lactide-co-glycolide (Example 3) and heparinized polyvinylpyrrolidone (Example 5) dissolved in dichloromethane, mixed and sprayed onto stents as described in Example 7. The stents are soaked in water until the sucrose dissolves leaving pores of the desired size. Nanoparticles of a mixture of heparinized poly-L-lactide, heparinized 50/50 poly-d,l-lactide-co-glycolide, heparinized polyvinylpyrrolidone and a mixture of genistein and sirolimus are deposited in the pores and the dried stents are top-coated with heparinized polyvinylpyrrolidone as in Example 7. Solid mannitol is micronized to a range of particle sizes of <1 micron, suspended in a mixture of heparinized 70/30 poly-l-lactide-co-caprolactone (Example 4), heparinized 50/50 poly-d,l-lactide-co-glycolide (Example 3) and heparinized polyvinylpyrrolidone (Example 5) dissolved in dichloromethane, mixed and sprayed onto stents as described in Example 7. Nanoparticles of a mixture of 70/30 poly-l-lactide-co caprolactone, heparinized 50/50 poly-d,l-lactide-co-glycolide, heparinized polyvinylpyrrolidone and a mixture of genistein and paclitaxel are deposited in the pores and the dried stents are top-coated with heparinized polyvinylpyrrolidone as in Example 7. The TIPS method used here is that of Y S Nam and T G Park, 1999, Porous biodegradable polymeric scaffolds prepared by thermally induced phase separation, J Biomed Mater Res 47: 8-17. Poly-L-lactic acid (100 mg) is dissolved in 5 ml of a mixture of dioxane and water at a ratio of from 84:16 to 90:10 v/v and warmed above the cloud point. The clear homogeneous mixture is sprayed onto stents in an atmosphere saturated with the same mixture of dioxane and water at the same temperature. The liquid coated stent is then rapidly cooled to −40° C., held at this temperature overnight, and then freeze-dried for 3 days. The stent is then sprayed with heparinized polymer nanoparticles containing genistein and top-coated with polyvinylpyrrolidone as in Example 7. Heparinized PLLA is dissolved in dichloromethane. The clear homogeneous mixture is sprayed onto stents using ultrasonic atomization technique at lower temperatures, as can be determined by one of ordinary skill in the art. The coated stent is then kept in vacuum oven at below glass transition temperature of the polymers for 2 hours. The pore size can be controlled in the range from 0.1 to 50 micron by changing the evaporation rate of the polymer solution. The stent is then sprayed with sirolimus loaded heparinized polymeric nanoparticles and coated with top layer of polyvinylpyrrolidone as in Example 7. Starting with a mixture of heparinized poly-L-lactic acid and polyvinylpyrrolidone and following the procedure of Example 13, a stent coated with porous heparinized poly-L-lactic acid and polyvinylpyrrolidone is prepared. This stent is sprayed with nanoparticles of a mixture of heparinized poly-L-lactide, heparinized 50/50 poly-d,l-lactide-co-glycolide, heparinized polyvinylpyrrolidone and genistein and then top-coated as described in Example 7. Starting with a mixture of heparinized poly-L-lactide, heparinized 50/50 poly-d,l-lactide-co-glycolide and heparinized polyvinylpyrrolidone and following the procedure of Example 13, a stent coated with porous heparinized poly-L-lactide, heparinized 50/50 poly-d,l-lactide-co-glycolide and heparinized polyvinylpyrrolidone is prepared. This stent is sprayed with nanoparticles of a mixture of heparinized poly-L-lactide, heparinized 50/50 poly-d,l-lactide-co-glycolide, heparinized polyvinylpyrrolidone, genistein and sirolimus and then top-coated as in Example 7. Starting with a mixture of heparinized 70/30 poly-L-lactide-co-caprolactone, heparinized 50/50 poly-d,l-lactide-co-glycolide and heparinized polyvinylpyrrolidone and following the procedure of Example 13, a stent coated with this polymer mixture is prepared. This stent is sprayed with nanoparticles of a mixture of heparinized 70/30 poly-L-lactide-co-caprolactone, heparinized 50/50 poly-d,l-lactide-co-glycolide, heparinized polyvinylpyrrolidone and a mixture of genistein and paclitaxel and then top-coated as described in Example 7. 2. The composition of claim 1, wherein the heparin is covalently bonded to one or both of the first and second polymers. 3. The composition of claim 1, wherein the polymer covalently bonded to heparin is biodegradable. 4. The composition of claim 1, wherein one or both of the first and second polymers is biodegradable. 5. The composition of claim 4, wherein the biodegradable polymer is chosen from poly(l-lactide), racemic polylactide, poly(l-lactide-co-glycolide), racemic poly(l-lactide-co-glycolide), poly(l-lactide-co-caprolactone poly(d,l-lactide-co-caprolactone), poly(l-lactide-co-trimethylene carbonate) and poly(d,l-lactide-co-trimethylene carbonate). 6. The composition of claim 4, wherein the biodegradable polymer is chosen from polylactides. 7. The composition of claim 1, wherein the first and second polymers are the same. 8. The composition of claim 1, wherein at least one of the first and second polymers comprises a blend of one or more polymers. 10. The device of claim 9, wherein the device is selected from sutures, staples, anastomosis devices, vertebral disks, bone pins, suture anchors, hemostatic barriers, clamps, screws, plates, clips, vascular implants, tissue scaffolds, bone substitutes, intraluminal devices, and vascular supports. 11. The device of claim 9, wherein the device is implantable into a mammalian lumen. 12. The device of claim 9, wherein the device is a stent. 16. The device of claim 12, wherein the concentration of the at least one pharmaceutically active agent based on the surface area of the stent ranges from about 1.0 to about 1.4 μg/mm2. 17. The device of claim 9, wherein the coating contacts the medical device. 18. The device of claim 9, wherein the coating contacts at least one inner coating that contacts the medical device. 20. The device of claim 9, wherein the device further comprises a protective coating over the coating, wherein the protective coating is free of a pharmaceutically active agent. 22. The device of claim 9, wherein the at least one biodegradable polymer is covalently bonded to heparin. 23. The device of claim 9, wherein the device further comprises at least one additional coating comprising a polymer covalently bonded to heparin, the at least one additional coating comprising at least one pharmaceutically active agent. 24. The device of claim 23, wherein the polymer is biodegradable. 27. The device of claim 9, wherein at least one of the first and second polymers degrades by hydrolysis in a natural intraluminal human body environment at preselected rates of degradation. 28. The device of claim 9, wherein the at least one pharmaceutically active agent is chosen from antithrombotics, anticoagulants, antiplatelet agents, thrombolytics, antiproliferatives, anti-inflammatories, antimitotic, antimicrobial, agents that inhibit restenosis, smooth muscle cell inhibitors, antibiotics, fibrinolytic, immunosuppressive, and anti-antigenic agents. 33. The device of claim 29, wherein the at least one pharmaceutically active agent is paclitaxel. 34. The device of claim 29, wherein the at least one pharmaceutically active agent is sirolimus. 35. The device of claim 29, wherein the at least one pharmaceutically active agent is genistein. 37. The device of claim 36, wherein the nanoparticles further comprise a polymer that is the same or different from the porous polymer, the nanoparticles being porous or nonporous. 38. The device of claim 36, wherein at least one of the nanoparticulate polymer and the porous polymer is biodegradable. 39. The device of claim 38, wherein the biodegradable polymer is chosen from poly(l-lactide), racemic polylactide, poly(l-lactide-co-glycolide), racemic poly(l-lactide-co-glycolide), poly(l-lactide-co-caprolactone poly(d,l-lactide-co-caprolactone), poly(l-lactide-co-trimethylene carbonate) and poly(d,l-lactide-co-trimethylene carbonate). 40. The device of claim 36, wherein at least one of the nanoparticulate polymer and the porous polymer further comprises heparin. 41. The device of claim 40, wherein the heparin is covalently bonded to the polymer. 42. The device of claim 36, wherein both the nanoparticulate polymer and the porous polymer comprise a biodegradable polymer covalently bound to heparin. 44. The method of claim 43, wherein the method further comprises impregnating the pores of the polymer with nanoparticles comprising at least one pharmaceutically active agent. 45. The method of claim 44, wherein the nanoparticles further comprise a polymer which may be the same or different as the porous polymer. 46. The method of claim 45, wherein at least one of the porous polymer or the nanoparticulate polymer is covalently bound to heparin. 47. The method of claim 45, wherein at least one of the porous polymer or the nanoparticulate polymer is biodegradable. 48. The method of claim 45, wherein at least one of the porous polymer or the nanoparticulate polymer comprises one or more of poly(l-lactide), racemic polylactide, poly(l-lactide-co-glycolide), racemic poly(l-lactide-co-glycolide), poly(l-lactide-co-caprolactone poly(d,l-lactide-co-caprolactone), poly(l-lactide-co-trimethylene carbonate) and poly(d,l-lactide-co-trimethylene carbonate). 49. The method of claim 45, wherein both the nanoparticulate polymer and the porous polymer comprises a biodegradable polymer covalently bonded to heparin. 51. The method of claim 50, wherein the heparin is covalently bonded to both the first and second polymers. 52. The method of claim 51, wherein the polymer covalently bonded to heparin is biodegradable. 53. The method of claim 50, wherein one or both of the first and second polymers is biodegradable. 54. The method of claim 53, wherein the biodegradable polymer is chosen from poly(l-lactide), racemic polylactide, poly(l-lactide-co-glycolide), racemic poly(l-lactide-co-glycolide), poly(l-lactide-co-caprolactone poly(d,l-lactide-co-caprolactone), poly(l-lactide-co-trimethylene carbonate) and poly(d,l-lactide-co-trimethylene carbonate). 55. The method of claim 53, wherein the biodegradable polymer is chosen from polylactides. 56. The method of claim 50, wherein the first and second polymers are the same. 57. The method of claim 50, wherein at least one of the first and second polymers comprises a blend of one or more polymers. 58. The method of claim 50, wherein the at least one disease or condition is a proliferative disorder. 59. The method of claim 58, wherein the proliferative disorder is restenosis. 60. The method of claim 58, wherein the proliferative disorder is a tumor. 61. The method of claim 58, wherein the proliferative disorder comprises the proliferation of smooth muscle cells. 62. The method of claim 58, wherein the at least one disease or condition is an inflammatory disease. 63. The method of claim 58, wherein the at least one disease or condition is an autoimmune disease. 64. The method of claim 58, wherein the at least one disease or condition is neointima and neointimal hyperplasia. 65. The method of claim 58, wherein the at least one disease or condition is selected from thrombosis, embolism, and platelet accumulation. wherein the at least one pharmaceutically active agent is chosen from heparin, flavonoids, paclitaxel and its analogs, rapamycin and its analogs and benzopyran-4-one compounds. 67. The device of claim 66 wherein the at least one pharmaceutically active agent is covalently bonded to the second polymer. 68. The device of claim 67 wherein the second polymer contains an electrophilic group and the pharmaceutically active agent contains a nucleophilic group reactive with the electrophilic group to covalently bond the pharmaceutically active agent to the polymer. 69. The device of claim 67 wherein the second polymer is chosen from poly(l-lactide), racemic polylactide, poly(l-lactide-co-glycolide), racemic poly(l-lactide-co-glycolide), poly(l-lactide-co-caprolactone poly(d,l-lactide-co-caprolactone), poly(l-lactide-co-trimethylene carbonate) and poly(d,l-lactide-co-trimethylene carbonate). 70. The device of claim 69 wherein the pharmaceutically active agent is a flavonoid. 71. The device of claim 70 wherein the pharmaceutically active agent is genistein. 72. The device of claim 66 wherein the at least one pharmaceutically active agent is covalently bonded to the first polymer. 73. The device of claim 72 wherein the second polymer contains an electrophilic group and the pharmaceutically active agent contains a nucleophilic group reactive with the electrophilic group to covalently bond the pharmaceutically active agent to the polymer. 74. The device of claim 72 wherein the second polymer is chosen from poly(l-lactide), racemic polylactide, poly(l-lactide-co-glycolide), racemic poly(l-lactide-co-glycolide), poly(l-lactide-co-caprolactone poly(d,l-lactide-co-caprolactone), poly(l-lactide-co-trimethylene carbonate) and poly(d,l-lactide-co-trimethylene carbonate). 75. The device of claim 74 wherein the pharmaceutically active agent is a flavonoid. 76. The device of claim 75 wherein the pharmaceutically active agent is genistein. 77. The device of claim 66 wherein the first and second polymers are the same or different. 78. The device of claim 67 wherein a pharmaceutically active agent is covalently bonded to the first polymer.